Patrick Norris has seen the worst that Afghanistan has to offer–excruciating heat, bitter cold, and death waiting behind every rock as comrades are blown to pieces by bombs and snipers. He returns home exhilarated by his new freedom and eager to realize his dream of a sport fishing business. But he is shocked to learn that the avocado ranch his family has owned for generations in the foothills of San Diego has been destroyed by a massive wildfire and the parents he loves are facing ruin. Ted Norris worships his brother and yearns for his approval. Gentle by nature, but tormented by strange fixations with a dark undercurrent, Ted is drawn into a circle of violent, criminal misfits. His urgent quest to prove himself threatens to put those he loves in peril. Patrick puts his own plans on hold to save the family's home and falls in love with Iris, a beautiful and unusual woman, when disaster strikes. When Ted's plan for redemption goes terribly wrong, he tries to disappear. Desperate to find his brother and salvage what remains of his family, Patrick must make an agonizing choice. Three-time Edgar Award-winner T. Jefferson Parker is known for his many bestselling crime novels, from Laguna Heat to The Famous and the Dead. 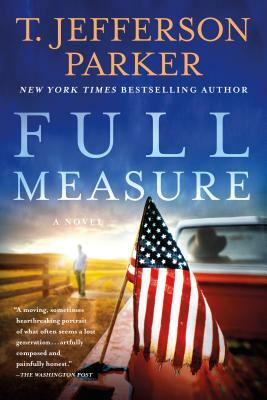 Full Measure marks a departure; it is a literary novel that explores many subjects, among them the bonds of loyalty between brothers.